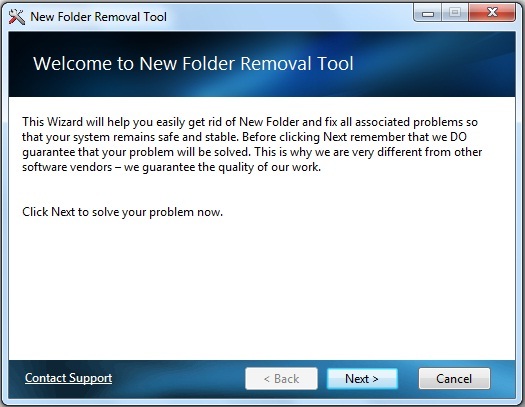 Get rid of New Folder virus infection (also known as Iddono) and remove malicious folders appearing everywhere in one click with this automated Removal Tool. The program cures all known modifications of Newfolder virus and fixes associated performance issues and "cannot open drive" error messages. Additionally, Live Support will help you in removing Newfolder infection in difficult cases. ...... get error messages, face corrupted registry settings or malfunction of some legitimate Windows components. On the countrary, Newfolder Removal Tool knows all possible consequences of New folder virus and not only removes Newfolder infection itself but fixes all associated Newfolder problems as well, so your system is safe and sound again. Additionally, Live Support will help you in eliminating Newfolder virus infection in difficult cases. Detect and remove spyware on your PC. Qweas is providing links to Newfolder Removal Tool 1.0 as a courtesy, and makes no representations regarding Newfolder Removal Tool or any other applications or any information related thereto. Any questions, complaints or claims regarding this application Newfolder Removal Tool 1.0 must be directed to the appropriate software vendor. You may click the publisher link of Newfolder Removal Tool on the top of this page to get more details about the vendor.